I'm delighted to announce that as of January 1, Lance Nichols has joined our team as our Green Coffee Specialist. Catalyst Coffee Consulting is a lean operation, and so is Dominion Trading (our importing partner). We don't hire people lightly. Since Andrew Russo pivoted from coffee to focus on earning his Master's degree in nonprofit management (and, guys, he's crushing it! ), we've needed to replace him. Lance Nichols has been at the top of our list for almost a year, for a lot of reasons. One reason is his relentless pursuit of coffee understanding, the kind that only happens when passion intersects with curiosity over and over for a decade. Lance has traveled to a number of coffee producing countries on his own dime, to better understand how coffee processing works in those particular settings and to teach coffee classes in English and Spanish. He put himself through the Q and other certifications. When he and Michael get on the phone together, I prepare for hours of discussion, because they both have minds that grasp the tiniest detail and its relation to the whole, whether we are talking about building better systems for releasing coffees for customers or the intricacies of the Ethiopian coffee grading system. When I think of Lance a goofy grin inevitably wiggles onto my face. I remember meeting him in Lima in 2015, the three of us possessing about one high schooler's worth of Spanish between us, and showing up at a pension that, yes, had our reservation, and yes, had given it to someone with cash. It was midnight and our only contact was in another state of Peru. We ended up in a sketchy hotel in the worst part of town called Los Molinos ("the grinders") that sold rooms by the hour. Next morning, we ventured across the city and stumbled across one of the best coffeehouse/roasteries any of us have ever experienced (I wrote about it for Sprudge here) in a complete fool's paradise of luck. 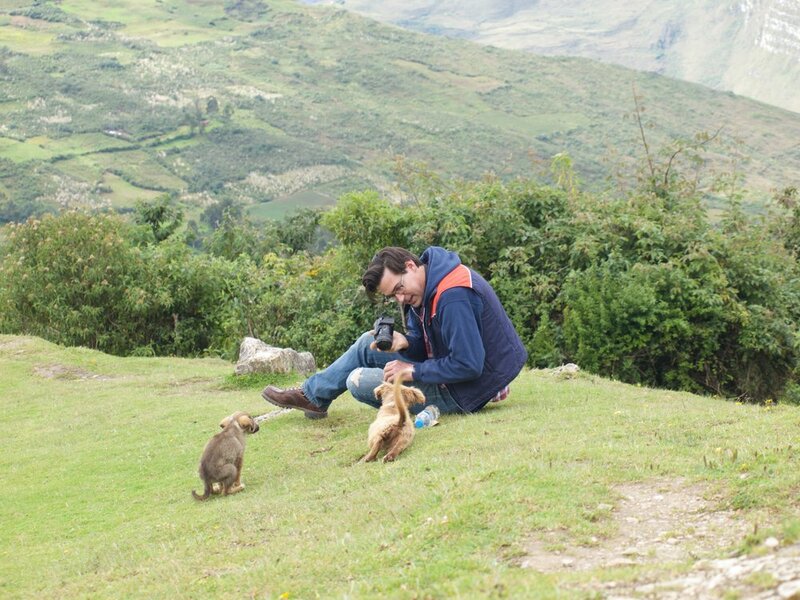 I also think of Lance playing with puppies on the top of the world at Kuelap, a walled city c. 700 AD found high in the Peruvian cloud forests of Amazonas, hours of terrifying road along sheer cliffs from the misty city of Chachapoyas. I remember the sun on my nose and the smell of the chamomile in the grass there. SCA 2017, 11 pm, I'd entered the kind of fugue state that trade shows induce in me, and we had walked to an Italian restaurant off the water in Seattle. Lance is the slowest eater I've ever met. He chews each bite with relish, thinks it over, goes back for more. There was a half-drunk bottle of wine on the table. I glanced at Michael, at Lance, at myself, and realized it was a moment of sheer happiness, complete with tomato sauce breath. Us in Peru, April 2015. There's a lot happening in Ethiopia and around the world in the Catalyst community, and we struggle to communicate it, to take good care of our wonderful customers, nail sourcing, quality control, and training, to stay as immersed as we must be in Ethiopian and global coffee trends, politics, and projects, and to handle the endless travel that this work entails. Bringing Lance onto the team is a big moment for us. Lance is beginning to apply his analytical approach and attention to detail to the complex job of working with our sourcing team to find the best Ethiopian coffees, celebrate projects and communities, and connect said coffees and communities with our roaster partners in the United States, Europe, and beyond. We are bubbling with plans and ideas, as we always are. For now, we are carefully connecting our roaster partners with Lance for everyday needs such as coffee releases and spot purchases and also for 2018 plans and big dreams. Reach Lance at lance@catalystcoffeeconsulting.com or (607) 220-9968 and tell him hello!